At the risk of having some readers running away, I inform that this was made sous-vide. But, you can adapt to your favorite method of cooking without problems. 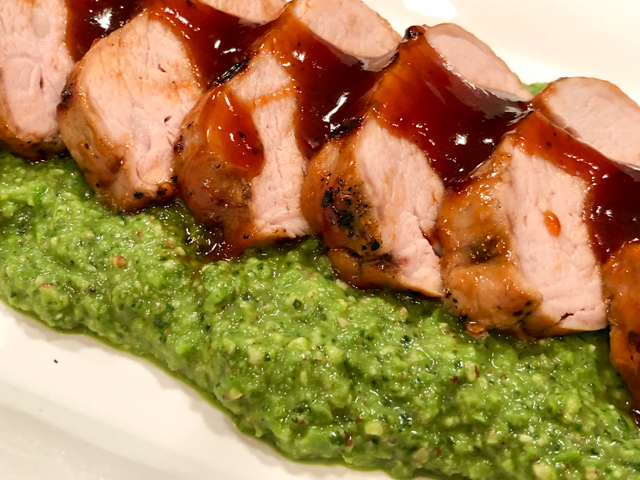 I made the glaze and the pesto the day before, and started the tenderloin in the sous-vide at lunch time, for a fantastically easy dinner on a Thursday evening. As I pat myself on the back, allow me to share the recipe with you. At least 3 to 6 hours before serving heat a water bath to 150°F (or your favorite temperature for this type of meat). Salt and pepper the pork then rub the lemon juice all over it. Place the pork in a sous vide bag with the butter then use the water displacement method to close the bag. Cook the pork for 3 to 6 hours. Make the glaze by mixing together all ingredients in a pan, and simmering for about 30 minutes, until thickened. Reserve in the fridge if made in advance. 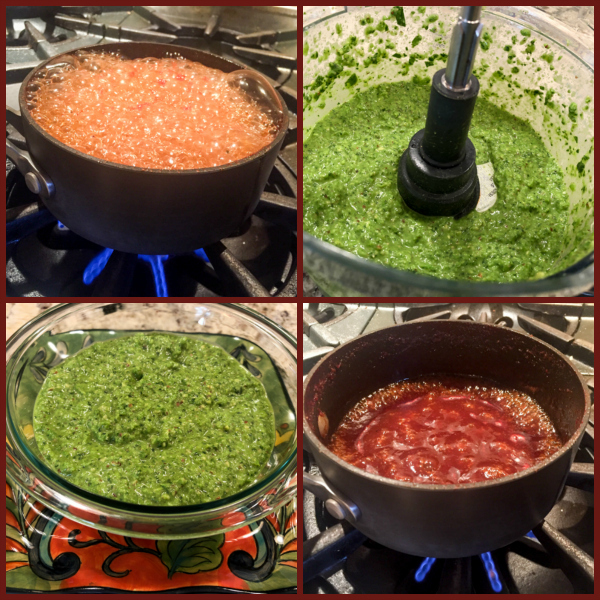 Make the pesto by adding all ingredients up to olive oil to the bowl of a food processor. When it’s all very smooth, add the olive oil, stir the Parmigiano cheese, and season with salt and pepper. It is better if made in advance so that the flavors have a chance to develop together. At dinner time, heat your grill or the broiler in the oven. Remove the pork from the sous vide bag and pat dry. Brush the tenderloin with the glaze and sear it on the first side for a couple of minutes. Brush the glaze on the side facing up and turn the tenderloin. Repeat several times until it is coated with the glaze, cooking about 30 to 60 seconds per turn. Remove from the heat, brush once more with the glaze, slice and serve with the pesto at room temperature. Comments: The composite photo above shows how I almost pulled my left hamstring. I started “simmering” the components of the glaze, but evidently things got out of control, and I happened to catch the scene from the other side of the kitchen. Let’s say I arrived in time to prevent a huge mess, but not without some discomfort on a big muscle that was not happy with the unexpected sprint. Oh, well. It was all worth it. The glaze is pretty spectacular. And yes, I increased the heat again to catch it on camera because it was quite beautiful in its own adrenaline-inducing way. Reminded me of the lab in Brazil, when we used to throw dry ice in hot coffee. Fun times. Have you ever done that? Pretty cool, check it out here. But, where was I? Oh, yes, our dinner. The pesto was wonderful too, but hubby preferred it warmed up, more like a pea puree of sorts. I like the contrast of cold with hot food, but I can actually enjoy it both ways. I leave the idea here, so you can decide how to serve it. On a chilly evening, the puree idea is quite attractive. Great weeknight dinner! 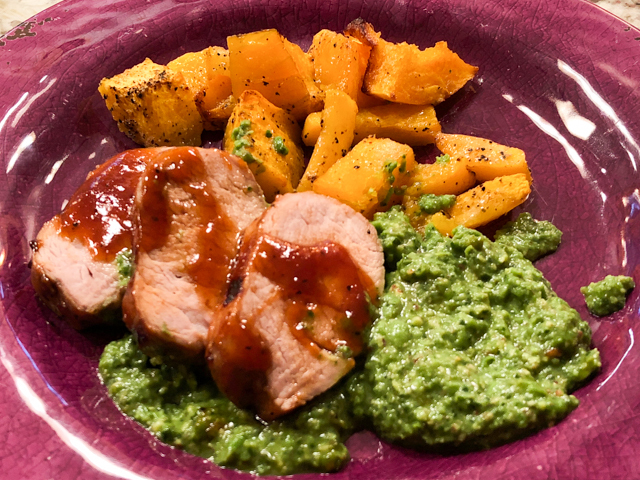 Pork, pea pesto, and roasted butternut squash.